We are excited to be providing a shuttle service to the Luxury Scottish Wedding Show at Hopetoun House. This is on Sunday October 1st. Charlotte Square at 11.30am. There will also be an afternoon departure from the Dome at 2pm and Charlotte Square at 2.15pm. Return trips to Edinburgh will leave at 1pm and at 4pm. This is a great chance to experience our wedding bus in person and our service will be free on the day. Feel free to contact us in advance if you would like to hop on board en route and we will certainly stop to pick you up. We will be at the lovely Pavilion cafe in the Meadows park each morning from 9.30am with face painting and bubbles at Bus Stop Art. Wait here for the big red bus to arrive and jump on board to take a round trip of Arthur's seat. Come and see us in August in the Meadows by the Pavilion cafe. 3 bus trips a day and art and facepainting at The Art Bus stop! 4 - 21st August just come along,tickets on board the bus. 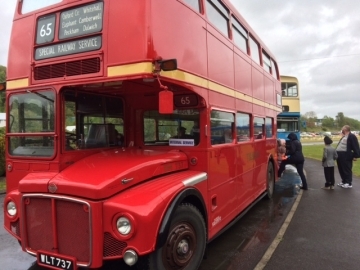 RM737 took part in the Scottish Vintage Bus Museum's Running Day at Lathalmond on May 21, joining dozens of other vintage buses of various sizes, colours, shapes and ages! 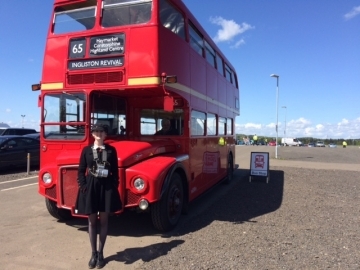 Our three-bus shuttle service – one every 20mins from Haymarket with a stop at Corstorphine – helped make the Ingliston Revival vintage motor show go in style. Thank you to our drivers Gordon, Andrew, Ian, Iain, Tony, Kenny and Sam. And conductors Charlie (seen here during a rare quiet moment), Stella, Sean, Ruth and Fiona. We're booked for next year's event! 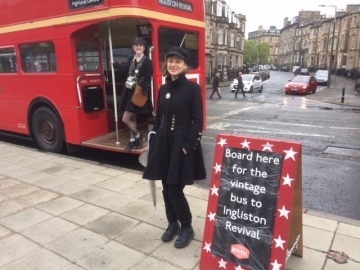 We are running a special service throughout both days 13 & 14 May to take passengers from Haymarket, Corstorphine, Royal Highland Centre every 20 minutes for the Ingliston Revival Motor Experience. Tickets Â£2 from our conductor on board. You can come down to our Edinburgh garage to see one of our wedding buses decorated with fresh flowers and ready to go out to a wedding most Saturdays throughout the year. Just contact us in advance to arrange. RM875 was in the Grassmarket, Edinburgh all day on Saturday September 24 as The Red Bus joined the finale of Sustainable Travel Week. Bob's Blunderbus, a free children's show, was a huge hit. Thank you to our conductor, Fiona, and driver, Ian. It was a special day for buses all round, with Lothian Buses opening its Annandale Rd depot and several old vehicles running on route 16 from Lothian Road to Granton and back. Below, RM737 in action on Castlehill with passengers from a French company on Thursday September 22nd. Java Dance returned to New Zealand at the end of August after 42 sellout performances of their fantastic hit show Back of the Bus. 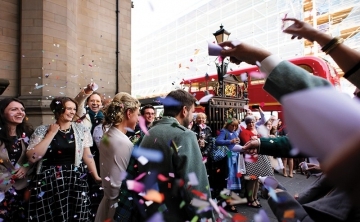 It ran twice a day on RM737, starting in Buccleuch Place and taking the audience on a very special hour-long trip around Edinburgh with dance, music and laughter. Congratulations to Java Dance director Sacha and all her team! Inspired by our lovely day at The Vintage Wedding Show today we would like to announce our Valentine's Day treat. We are offering the first 15 of you to get in touch a free ride next Sunday at 12 midday from George Street Edinburgh. Let us take you on a Valentine's day trip for half an hour with a glass of bubbly, chocolates and music. Message me quickly as only only the first 15 I hear from will receive their free tickets! 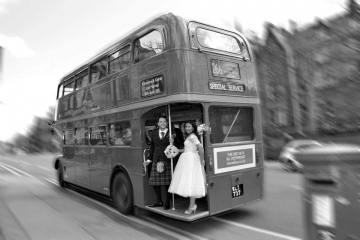 The Red Bus will be at the Vintage Wedding Show on 7 February at the Waldorf Astoria Edinburgh: The Caledonian (Princes Street end of Lothian Road). Come onboard and have a look at the bus in full wedding mode. We will be there to answer any questions about routes, venues, plans and costs. From 11am to 4pm. We had the day at The Edinburgh Steiner School Christmas Market and enjoyed welcoming lots of children on board for storytelling and facepainting at this magical event. 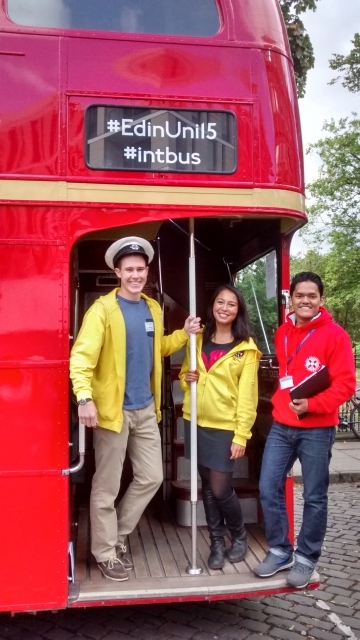 The Red Bus was in George's Square to welcome international students to Edinburgh University for freshers week. Volunteers handed out information and snacks, and the sun shone. 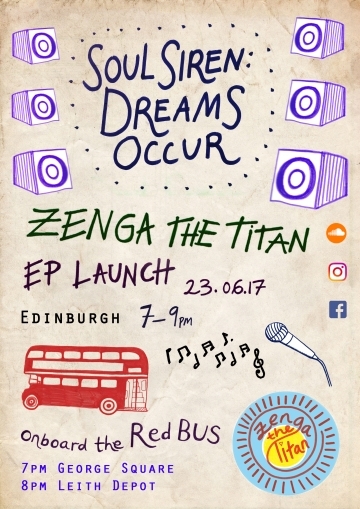 On Sunday 19th July, The Red Bus turned off King's Stables Road and squeezed over the railway bridge into Princes Street Gardens. For the next three hours the bus was packed with children who had animal balloons made by Big Pete Aubery. Pete reckons he made more than 350. Hats off to you Pete and to our conductor for the day, Laura Griffin! We have been blessed with some terrific weather this summer as The Red Bus has got out of Edinburgh. Here we are at beautiful Broxmouth Park, near Dunbar. In the background is a vintage taxi from Ecosse Cars. 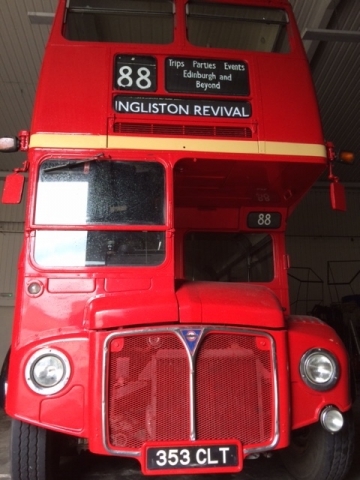 Repanelling and painting of our first bus, RM1353, was completed in spring 2015. Our thanks to Andy Crockett and Peter Mitchell at the Scottish Vintage Bus Museum for a wonderful finish. The bus took a trip around town with a terrific group of Dads and children on board, as part of an art workshop led by Stella Phipps. 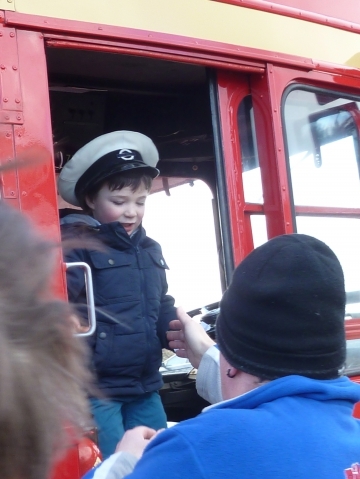 Thank you to all the parents and children who came to the first ever Red Bus Open Day at our depot in Granton on Saturday January 24. More than 150 people came to ride on RM875, sit in the cab of RM737 and have their photo taken, eat Luca's ice cream and cakes made by Iona. There was also table tennis and table football, as well as music from Joe the fiddler. A big thank you to Gordon for driving and taking photos (not at the same time) and to our conductors Stella and Emma. You don't need a bus driver's licence to drive our bus! Half an hour behind the wheel of the Routemaster and driving in our yard. Bring your family and friends to be your passengers and allocate one to be the bus conductor. Great photos on the day. Personalised destination blind included. Â£75. Java Dance performed their fabulous Fringe show on board The Red Bus! "Back of the Bus" ran from 4 - 22 August and was fully sold out. The bus was voted Best Venue in the Dark Chat Awards 2014. 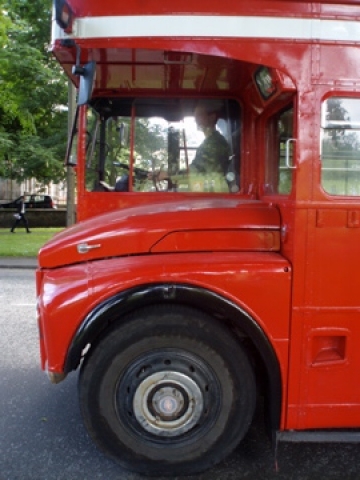 More than 120 Routemasters attended the RM60 event in Finsbury Park, north London, last Sunday. 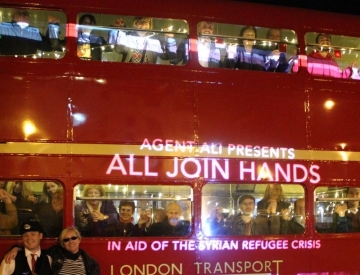 The rally was to celebrate the 60th anniversary of the unveiling of the first Routemaster prototype in 1954. It was a fantastic occasion, and Sam from The Red Bus was there. 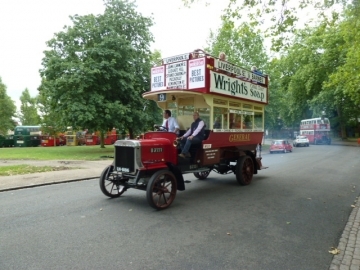 Other vintage buses on show included this 1910 B type, thousands of which were used in World War 1 to transport troops and ammunition and even housed carrier pigeons. On return from France and Belgium they were repainted red from khaki and went about their original business again in London well into the 1920s. The Routemaster evolved directly from this! The Red Bus has joined Mel and Jay's Vintage Wedding Collection, a fantastic source for couples looking for authentic vintage glamour. 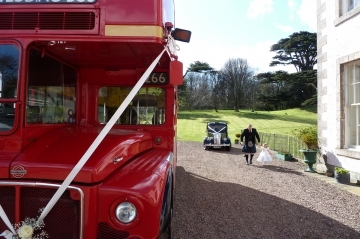 See the ideas at www.vintageweddingcollection.co.uk for entertainment, photography, fashion, flowers... and of course transport!